There’s no doubt that entering a password to unlock your computer is one of the many ways to keep your data secure. However, if you’re the only person using the machine, those password prompts you receive after waking it up from sleep may become annoying. Go to Settings > Accounts > Sign-in options. Select Never from the Require sign-in dropdown menu. Open the Power User menu by pressing Win+X. Select Command Prompt with administrative rights. 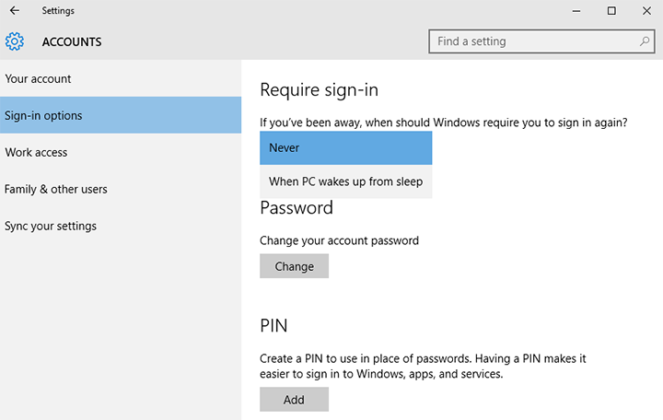 *Set the value to 1 if you need to re-enable the password prompt on wakeup. Did you find this article helpful? See other Windows tips & tricks on our blog and be sure to join us on Facebook, Twitter or LinkedIn to get all the latest news and updates as they happen.